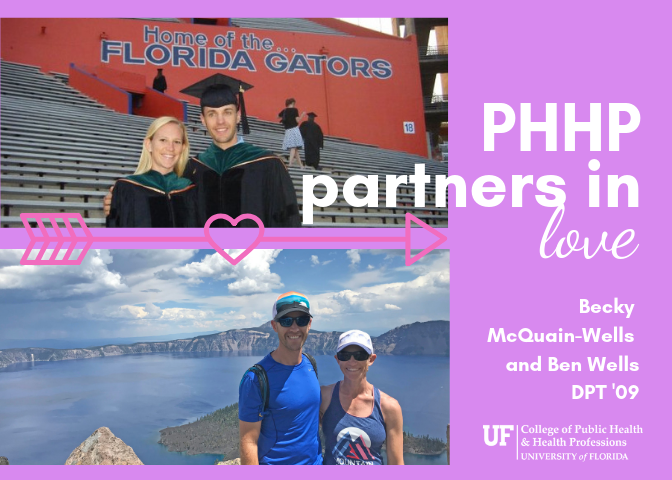 Becky’s earliest memory of Ben comes from the first week of classes in the Doctor of Physical Therapy program. Ben was helping a classmate with anatomy and he struck her as smart and a good team player. But it wasn’t until second year of the DPT program when things really clicked for Becky and Ben. They had moved into an apartment together with a mutual friend. Living together meant spending even more time together, whether it was working out, driving to school and internships, tailgating or doing group projects. They have fond memories of going to Lake Wauburg to kayak, play frisbee golf and rock climb. And of course, cheering on Gator sports teams. Since graduation, Becky and Ben have worked together all but a year and a half. They currently work for Kaiser Permanente as home health physical therapists. Outside of work, the couple, who has been married for six and a half years, loves to travel, especially to visit friends and national parks so they can hike and trail run. They also train together for triathlons; last year, Becky competed in eight races and Ben in six. In 2016, they created the McWells Scholarship to provide financial support for UF DPT students. 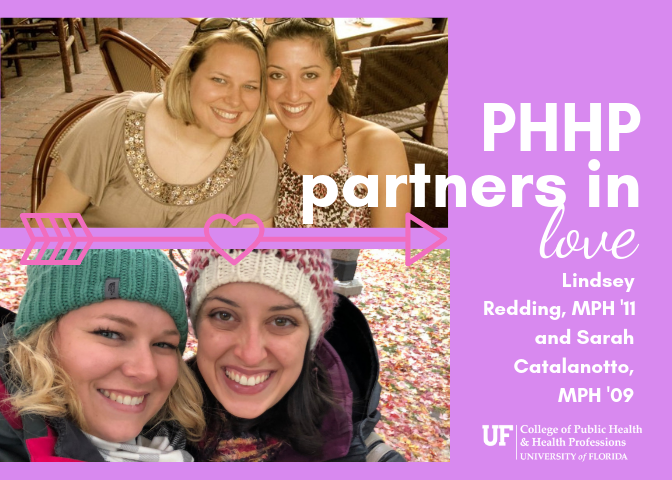 Sarah Catalanotto and Lindsey Redding first met in 2010 at a Master of Public Health student event at the home of Mary Peoples-Sheps, Dr.P.H., then the college’s senior associate dean for public health. That night, Sarah and Lindsey had a great conversation. Sarah felt sparks right away and was excited to meet someone driven and ambitious. Lindsey thought Sarah was fun and hoped they would become friends. It wasn’t until they connected again several months later, however, that their romance really began. After a first date at Mother’s Pub, Sarah and Lindsey spent a lot of time together, attending campus events and hanging out with Lindsey’s fellow graduate hall directors. “The campus environment was welcoming, exciting and beautiful. It’s great to be a Florida Gator,” they said. Following graduation, both accepted jobs at north central Florida public health agencies. Sarah is the executive director of Suwannee River Area Health Education. Lindsey is the director of community initiatives at WellFlorida Council. She is also in her third year teaching the UF public health online course on assessment and surveillance. “In many ways, our shared experience of working in public health allows for deep conversations and discussions about public health issues, but public health is a broad field and we share different passions,” they said. Lindsey’s interests are in community assessment and solutions-oriented program development, and Sarah’s passions are community education and access to care, especially in rural communities. Sarah and Lindsey say that public health in north central Florida can feel like a small world, especially after serving the community for several years. Sarah and Lindsey married in 2017 and they share the home they built in High Springs with two dogs and one cat, all rescues. They enjoy outdoor activities, such as kayaking, walking, camping and yard work. They also travel all over the world. Destinations include various islands in the Caribbean as well as Canada, Cambodia, Guatemala, Thailand, England and Vietnam. Next up is Italy this August. 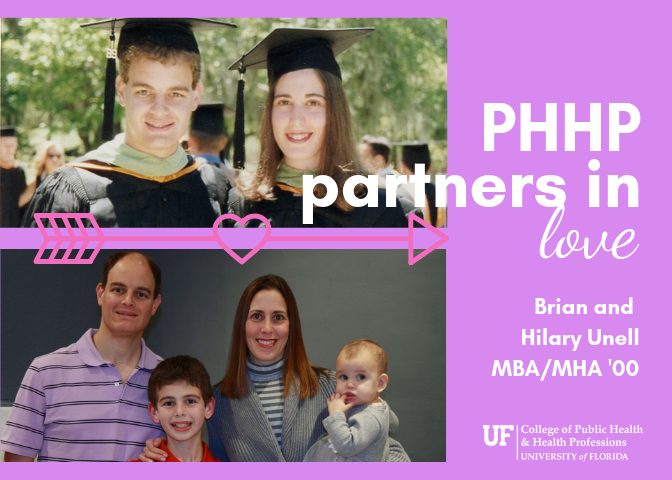 Brian (BS ’97) and Hilary Unell’s love story began in the late ’90s when they were among 11 students in UF’s dual Master of Business Administration/Master of Health Administration program. They socialized within a group of friends for more than a year before sparks flew. Their favorite date spots included Las Margaritas, Harry’s, Leonardo’s, The Swamp Restaurant and Don Pablo’s, as well as Gator games and Sister Hazel concerts. Brian and Hilary say that having shared professional interests brings a unique element to their relationship. They continue to cheer on the Gators — most recently in the stands at the Florida-Georgia men’s basketball game in Athens last month — and they attend Sister Hazel concerts when the band comes to Atlanta. Treat each other as if every day is a special occasion instead of going all out just because it’s a birthday, anniversary or holiday. Make an effort to start and end each day with a smile, kiss and hug. Keep “it’s not my turn or it’s not my job” thoughts out of your mind and words out of your vocabulary. Instead, if you see something that needs to be done, do it.